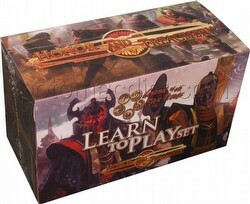 Honor & Treachery is a learn-to-play set for the Emperor Edition Arc. Play either the manipulative Scorpion or the peaceful Phoenix, learn the secrets behind the War of the Twins, and the duel between Bayushi Nitoshi - the Scorpion Champion - and Shiba Tsukimi - the Phoenix Clan one that concluded it. Honor & Treachery includes 2 fully playable decks in the Emperor format for Phoenix and Scorpion clans (both containing exclusive and alternate art cards for each clan), 2 unique deck boxes (with the colors of the Phoenix and Scorpion clans), a 64-page story book on the War of the Twins, and a fully illustrated rulebook that includes a full play-by-play guide of your first game of Legend of the Five Rings.